Parts of Austria enjoy plenty of fresh snow! Especially Lower Austria and the Mariazellerland were blessed in the last days with up to 60 cm of long awaited white splendour. Many “JUFA Ski Resorts” are regularly selected among Austria’s most economical ski resorts. Especially families with children can expect a top price-performance ratio at many JUFA Ski Resort Hotels. 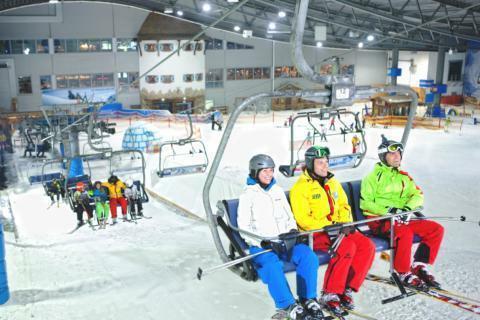 Indoor ski slopes – JEVER Fun Ski Hall Neuss! Holiday in beautiful North Rhine-Westphalia and ski on snowy pistes? The JEVER Fun Ski Hall makes this possible! Two T-bar lifts, a four-seater chair lift, gentle slopes with 10 to 18 per cent gradients and a steep slope with a 28 per cent gradient await you at Germany’s first indoor ski hall. Get fit for the mountains and then relax afterwards at the JUFA Hotel Jülich im Brückenkopf-Park***! Due to the favourable situation (1,600 – 2,200 m above sea level), the ski area Planneralm offers excellent slopes with natural snow from the beginning of December to the end of April. The small, fine and family-friendly ski resort thrills with great infrastructure: Glass floor lift, Plannerjet and Corner rail, the Kinderland with two magic rugs and cable lift, … and, of course, lots of fun in the huts! Enjoy skiing on perfectly groomed natural snow slopes! Here you get to ski on 100% natural snow. The Frauenalpe operates 36 ski lifts and has 36 hectares of slopes. It is a popular ski resort in the Murau mountains. Beginners and children also feel comfortable on 9 slopes with all levels of difficulty. Enjoy carefree days on the slopes at this small and excellent family ski resort! Here families can roam over perfectly prepared slopes! On a slope length of 11 km, you can find all levels of difficulty – from blue to red, up to three black slopes for really advanced skiers. Well trained instructors are also available for all winter sports enthusiasts. In the 20,000 m² Children’s Land, it is really fun to practise the first “Bogerl”. Experience slope magic at the Stuhleck, the highest mountain on the eastern edge of the Alps, with a height of 1,782 m. The ski area is waiting for you with great attractions: The snow park, the WISBI race piste, rail park, speed-measurement slope, snow tubing and a night slope leave nothing to be desired. Beginners get their first runs on the practice slope in Semmi’s Kinderland, until they are fit for the “big” slopes. How about skiing or tobogganing on the western Styrian Salzstiegl? The ski and tobogganing resort has it all: 40 hectares of slopes, 12 km of runs, 6 ski lifts, rustic cottages and guesthouses. But also the day and night toboggan run scores with a 2 km long illuminated slope. The ideal winter trip for the family holiday. Families with children feel particularly comfortable here: 4 ski lifts pull you up to the start of the overviewable ski and snowboard slopes. The Schiregion Gaberl is a ski resort with charm and varied degrees of difficulty. Or would you prefer cross-country skiing? On a 15 km long trail you go through the snow-covered forests of the Western Styria. Fancy a great skiing holiday with the whole family? Skiing does not always have to be expensive! In our blog post we show you some great money saving tips and favorable insider tips. There is fun on the slopes! What is the snow situation at the ski resorts? Im interested in the offer "JUFA Ski Resorts" in the .